Many new cars come with backup cameras that make it so much easier to reverse without having to worry about navigating around obstacles or, heaven forbid, hitting a careless pedestrian who doesn’t want to stop walking. Most older cars don’t have this great feature though, and some new cars don’t have it either unless you want to pay for a pricey upgrade package. There are tons of aftermarket backup cameras out there that you can install on any car, but they’re usually a pain because you have to run a wire from the screen all the way to the back of the trunk where the camera is mounted. But the AUTO-VOX M1W Wireless Backup Camera Kit is wireless, so you don’t have to worry about that! It normally sells for $110, which is a fair price for such a great camera kit. Use the coupon code Z29XZ2NF at checkout, however, and you’ll only pay $63.79. ★ Parking Safely & Effortlessly – With AUTO-VOX Wireless Backup Camera Kit,you will now be able to easily park your car even in the tiniest parking spots.Without risking damaging it and ruining your day or night! Without Battery! 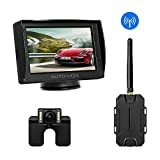 ★ Wireless Design for DIY Easy Installation – No More Complex Wiring Problem.AUTO-VOX 4.3” LCD rearview monitor connect a backup camera by a wireless transmitter.Wireless transmitter takes the place of complicated long video cables.Make all things much easier. ★ IP 67 Waterproof Transmitter – You can install it anywhere near the reversing light. Suitable for most cars,vans,camping cars, trucks even RVs.No any interference with other wireless devices, if you ensure stable and high resolution image with 100M acceptance range in open areas. ★ Amazing Rear View Camera – 6 High Brightness LEDs,26 lumen for single LED,will automatically turn on/off according to environment light intensity. Digital high-definition image processor will present superior night vision for you.Super IP68 water-proof standard. ★ Strong Force and Reusable Car Monitor Mount – The Monitor with strong adhesive silicone bracket mount enable to mount it on windshield or dashboard. After long time using, the monitor holder may become dirty and non-sticky, the suction pad can be washed and reuse again.